A Military Minelayer is a cargo ship hauling many warheads, and explosives. 1x Gatling turret on the top. 1x Gatling turret on the bottom. 2x Gatling turrets on the front. 1x Missile turret on each side. The locations of all the warheads on board. This ship has fifteen warheads, all positioned to detonate in a chain reaction when reverse thrust is applied. If the warheads are detonated, there won't be much left of the ship to salvage (shown right). 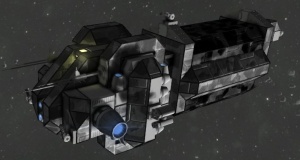 The ship's exterior will remain mostly intact, however all of the valuable modules will be destroyed; only the carcass of heavy armor blocks will remain. Sometimes, in a very rare case, not all warheads will ignite. 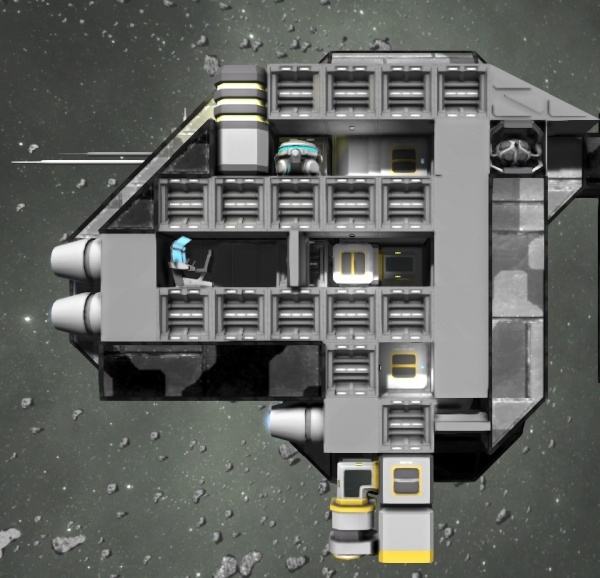 You will lose the thrusters, containers and turrets on the back part of the ship. But the front end with the reactors and the large cargo containers will remain mostly unscratched. Align your engineer perfectly with the military minelayer's beacon, with the correct rotation, and allow the minelayer to move into you. Your engineer should saw off the upper part of the armor which can take some time, however you should be safe. After this is gone, you will be able to fit like a glove into the compartment in which the beacon is in. Once here, you may or may not hear shooting, but you will have a limited amount of time. In this time, you must saw into the interior wall beneath your feet in which you will have direct access to the cockpit. Once in the cockpit, immediately disable thruster 22. This will disable the trap. If you go for a kill, shot at the warheads in the back. That will destroy both reactors and the upper, lower and back Gatling turrets. But you will also loose all four large cargo containers and several of the small cargo containers. There are two sections to this ship, but only the front section has an interior that isn't filled with explosives. At the bottom of the ship is a door that leads to a vertical shaft made with passage blocks. Top: Access to two large cargo containers, a gravity generator, and the beacon behind that. Middle: Two small reactors and the cockpit. Bottom: Access to two large cargo containers. Removing/disabling the small thruster with a grinder. Some heavy armor blocks, or warheads and a ramp need to be removed to gain access to this thruster. When you can access the thruster, use the grinder on them, at least until they are disabled, then you're ready to go. Each of the four large cargo containers can easily be raided. The small cargo containers are near the turrets and hold extra ammunition. There are two small reactors accessible from the interior containing 10kg of Uranium each. As of v.1.030 (list), the new Military Minelayer has only one boobytrap. It is now equipped with a Collector and a Connector which are connected to the large cargo containers via conveyor tubes. The cargo capacity is slightly enlarged due to the additional small cargo containers near the turrets. But these are not interconnected.